A sea of red as EYCI dips under 500¢. Home > Cattle > A sea of red as EYCI dips under 500¢. 26 Apr A sea of red as EYCI dips under 500¢. A glance at the weekly cattle price changes are an uncomfortable sight both domestically and in key offshore markets. Local prices are under pressure from the weight of throughput, particularly out of NSW and Queensland, while the 90CL beef export price to the US succumbed to concerns of high supply. Table 1 highlights the weekly movement of East coast domestic cattle prices along with a measure of the movement from last season’s price levels. 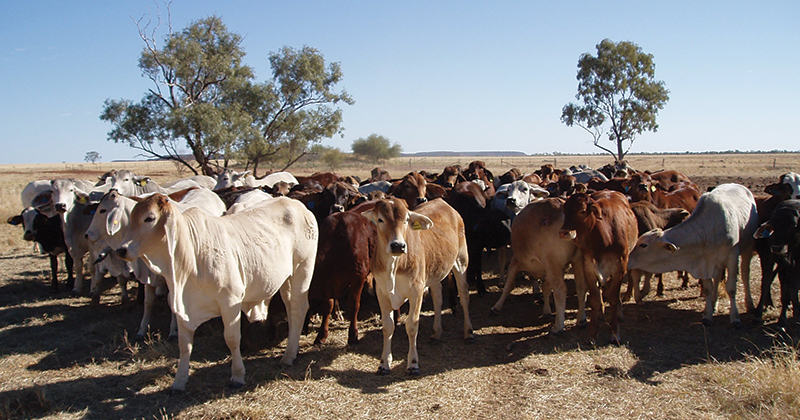 The Eastern Young Cattle Indicator (EYCI) is off 3.7% to 495.7¢/kg cwt, as a lacklustre start to the Autumn break forces producers to bring forward stock to market. The EYCI moves were mirrored in all other cattle categories, although Trade and Heavy Steers are holding up reasonably well in comparison to other classes with declines of only 1.3% (281¢/kg lwt) and 2.6% (260¢/kg lwt), respectively. Medium cow, the worst effected on the week, had a 12.7% drop to finish at 173¢/kg lwt. The Western Young Cattle Indicator(WYCI) is also matching the trend with a 2.4% fall to close at 562¢/kg cwt. In offshore markets, the 90CL frozen cow appears to be reacting to concerns over anticipated high fed cattle slaughter levels in the US over April driving it to drop 3.2% to 566.5¢/kg CIF – Figure 1. Increased cattle throughput was noted across all states this week. The big increases were particularly evident in NSW and Queensland when compared to their respective five-year seasonal average levels. Current NSW throughput is 73% higher than the seasonal pattern, QLD is at 67% higher and WA is sitting 43% above. In contrast, Victoria and South Australian cattle throughput only marginally over their five-year seasonal pattern at 1.4% and 1.2%, respectively. The impact of the high NSW and Queensland throughput is evident in the broader East coast yarding levels with the 84,395 head sitting 50% higher than the seasonal five-year pattern for this time in the year – Figure 3. Apart from the coastal extremities of NSW and Southern Queensland, there is not much rainfall on the horizon for the week ahead for much of the nation. Cattle prices are likely to remain under pressure while the Autumn break in the South remains elusive. The 90CL is approaching key support at the 550¢ region so may fortify local young cattle prices if it can hold this level. a .